Rotary drilling techniques are utilised where drilling into bedrock is required to check for shallow mine workings or to determine rock quality. All our drilling rigs can undertake rotary coring to recover rock core samples at various diameters. The cores are then logged by experienced geoenvironmental engineers in accordance with the relevant British and European standards. 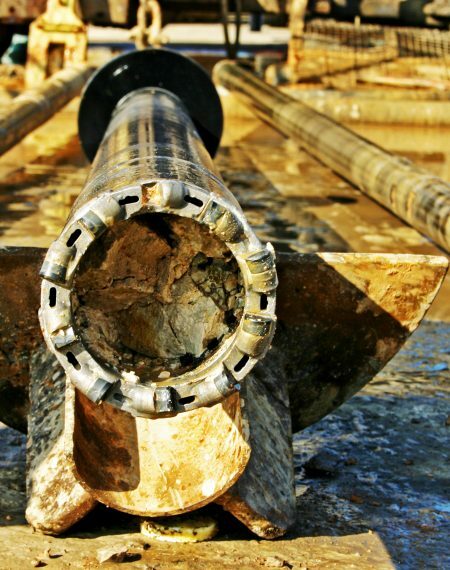 Alternatively the borehole can be drilled using rotary open hole methods in which samples are not recovered; rock cuttings are returned to the surface during the drilling and this allows a rapid examination of the strata. This method is often appropriate to locate shallow coal seams or mine workings and allows a number of boreholes to be completed in a short space of time. Continuous monitoring of gases such as carbon monoxide, methane and carbon dioxide can be carried out while drilling through old mine workings. All of our rotary rigs are able to carry out Standard Penetration Testing (SPT) in soil or rock. On completion, gas and groundwater monitoring pipes are often installed in the borehole to allow later measurements by our dedicated technician. Our crews have experience of drilling and sealing off boreholes through rocks containing artesian groundwater conditions. In some cases it is possible to combine site investigation drilling with the installation of ground loops for heating purposes, achieving overall cost savings for the project; our sister company Dunelm Well Drilling can provide further information on this aspect. Dunelm have a variety of rotary drilling rigs available to suit all types of projects. Each rig is supplied with a separate compressor unit, together with water bowser if required and all other equipment needed. The rigs are mounted on wheels or tracks to enable access over different types of terrain. Ground mats can be supplied for use on soft surfaces such as grassed playing fields where the surface needs to be preserved. Simultaneous drilling and casing using a Symmetrix system can be undertaken to enable drilling through unstable ground and a variety of different flushing systems are available as appropriate to the ground conditions.